High along Oak Creek Grade, eight miles south of Cañon City, Colo., where the pavement ends and the road melts into the Pike-San Isabel National Forest, travelers come upon an unexpected sight – neat rows of dark-green vines bearing deep-purple grapes. Vineyard owner Jeff Stultz says many people stop to take photos, unaware that back in Cañon City, in the tasting room at the Winery at Holy Cross Abbey, they will find a wine made from those high-country grapes. It’s a wine different from other Colorado wines, which is fitting for the singular winery rooted at a former Benedictine Monastery. The wine is a Norton, made from the American hybrid grape of the name familiar in the South and Midwest but a commercial rarity in Colorado, where the industry is dominated by European grape varieites, which aren’t always the right match for Colorado’s cold winters and unseasonal frosts. The vines belong to Stultz and his wife Sue Allen-Stultz and Jeff’s parents, Fred and Gloria Stultz. Jeff is the assistant winemaker at the Abbey winery and in a former life was head greenskeeper at the Steele Canyon Golf & Country Club near San Diego, where Sue was the head golf professional. 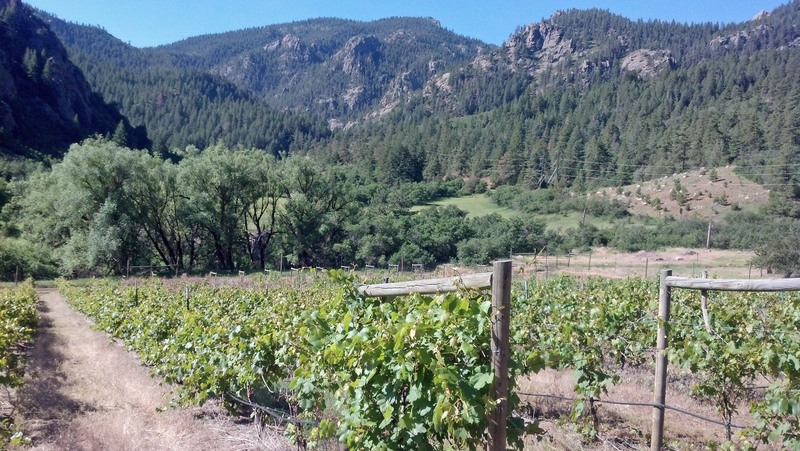 Jeff’s family homesteaded near Cañon City in 1873 and when Jeff and Sue decided in 2001 to make Colorado their home, they found his parents already had some vines at the family ranch, which sits at 6,800 feet. Those vines also were the expected European wine grapes, including cabernet sauvignon, merlot and chardonnay, all ill-suited to what may be the highest vineyard in the nation. On the advice of Abbey winemaker Matt Cookson and state viticulturist Horst Caspari, an outspoken advocate of hybrid varieties, Jeff planted riesling and Norton vines. Norton was developed in the early 1800s by Daniel Norton in Richmond, Va. Considered the cornerstone of a burgeoning U.S. wine industry until Prohibition ended most domestic winemaking, the grape today is grown along the East Coast, South and Midwest, where it’s sometimes referred to as the “Cabernet of the Ozarks.” It’s so popular that famed Austrian glass manufacturer Riedel made a special Norton glass in 2009..
Norton is popular because it is disease- and cold-resistant and lacks the pungent “foxiness” found in other hybrids. During the 2012 Drink Local Wine gathering in Denver, several Nortons were tasted and at least one of them, from Missouri but I can’t find my notes to tell you the name, was quite enjoyable. The others were unremarkable. Back to Stultz: As his Norton vines matured, Stultz had enough grapes for Cookson to blend some into a popular merlot-based sweet red wine called Sangre de Cristo Nouveaux. Stultz discovered that sending the Norton juice through malolactic fermentation, which converts harsh malic acid into softer lactic acid, drops the wine’s initial acidity (and its pungency) while enhancing the grape’s dark-berry fruit characteristics. He said the vineyard’s elevation produces smaller grapes with deeper phenolics, which affect the color, flavor and mouthfeel of the wine. It’s not like they’re over-run with grapes. In 2010, about three tons of Norton were harvested, enough for 65 cases. That wine, likely the only 100 percent Norton bottled in Colorado, was released this spring and is expected to sell out quickly, said winery spokesperson Sally Davidson. The Winery each year produces between 13,000 and 14,000 cases of wine, but don’t expect much expansion in the hybrid line. Cookson wants to focus on his present line of wines and Stultz, who judges homemade wines at the Fremont County Fair, is blunt in his assessment of most hybrid wines. The wine is available only at the winery in Cañon City.